(Natural News) U.K. supermarket giant Waitrose has been walking the walk when it comes to environmental issues for at least the past five years. In that time, it stopped sending waste to landfills, started selling “ugly,” less than perfect-looking produce, and began turning any food that could not be donated into electricity. That’s already a pretty impressive track record, but the company wanted to take it a step further by reducing the environmental impact of its delivery trucks. Biodiesel fuel was considered and rejected because of its exorbitant cost, and electric trucks were found to be impractical because they make use of heavy batteries that are time-consuming to recharge. Then they hit on the perfect solution: trucks that are powered by compressed natural gas (CNG) made from food waste. Waitrose has become the first European retailer to use these innovative trucks, but other companies are likely to follow suit because of the enormous benefits involved. Though the trucks themselves cost about 50 percent more upfront than their mainstream counterparts, the costs are quickly recouped because the fuel is between 35 and 40 percent less expensive than regular fuel. The use of CNG fuel will save the company about $100,000 for each truck over the course of its lifetime. Other benefits of these special trucks include the fact that they can drive for up to 500 miles on a single tank of fuel, and they emit about 70 percent less carbon dioxide into the atmosphere than diesel vehicles. The new trucks are also far quieter than diesel trucks, and are quicker and easier to refuel. At present, Waitrose is only making use of 10 of these special trucks, but there is more than enough fuel from food waste to fuel thousands more. Indeed, CNG could replace half the gas in the grid by as early as 2020, if all food and other waste were utilized in this way. Even with the resources available right now, many more trucks could take to the road. 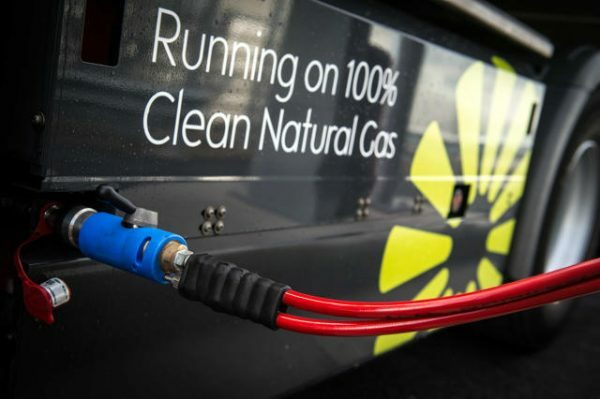 “As of today, there is sufficient biomethane, or renewable gas, from food waste to fuel thousands of trucks — I would say somewhere between 2,000 and 5,000 trucks,” said Philip Fjeld, CEO of CNG Fuels. More and more sewage treatment plants in Europe and the U.S. are waking up to the possibilities of biomethane. Approximately 15 plants in this country are already sending food waste, mostly from commercial sources, to facilities which generate fuel. A further 860 sewage treatment plants are generating biomethane on-site to help provide power to run their own facilities. “We no longer consider [food] to be a waste product — it’s something we’re trying to manage as a resource,” said Mark Hutchinson, an agricultural extension professor at the University of Maine. It is truly encouraging to note that both private and other companies are taking the initiative to search for alternative, environmentally-friendly and cost-effective fuel sources. For the moment, however, this incredible resource lies mostly untapped, with much of our food waste still ending up in landfills.